For many years, the Church had the challenge of teaching the faithful the truths of Christianity, made more difficult because in the first centuries most people could not read.Thus, to teach the faithful, there was the need to develop picture books. Today we call them stained glass windows. The faithful came to Church, saw the beautiful windows and learned about the life of Christ. This site will present the picture book found at the Church of Assumption. 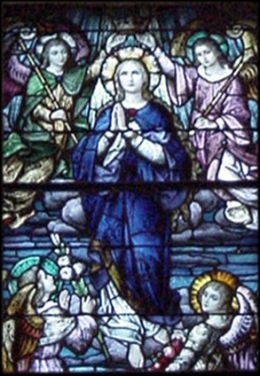 If we were to title our picture book, it would be called, The Life of Mary in Stained Glass.